After pulling together a casual weekend look and a slightly more polished day look, I wanted to take things in an evening direction for this third and final look in a series inspired by the first-edition cover of Beatrix Potter’s The Tale of the Flopsy Bunnies. My main goal in putting together this final look was to try to translate that fresh, garden-party, earthy, spring-y feel of the cover into a look that would feel right for evening. Here’s what I’m thinking: eyes softly defined and contoured in earthy brown and beige shades, lined with bronze liquid liner (or, alternatively, deep, smudgy, plummy brown) and accented with a luminous peachy-pink; cheeks dressed in a slightly brownish-berry cream blusher; and lips stained (or dressed full-on, depending on comfort level) with a vampy brown-berry (often called “black cherry”) lipstick. Garden party after dark. In the foreground, Bobbi Brown Lip Color in Blackberry. 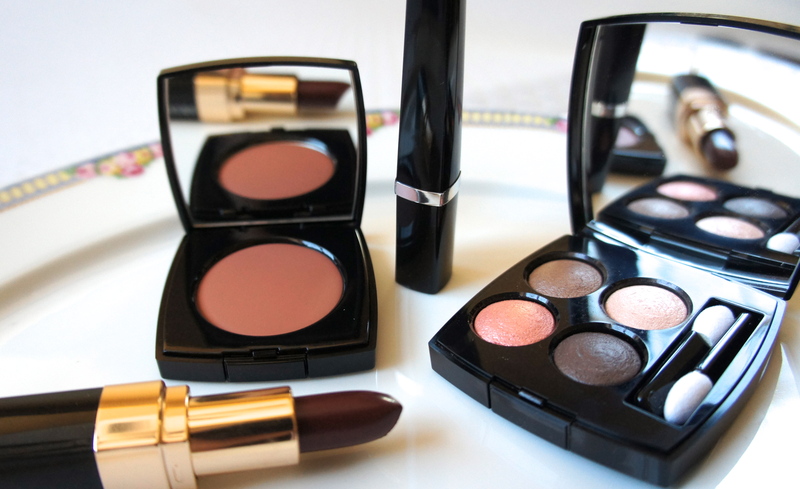 From the left, Chanel cream blusher in Cheeky; Ligne Graphique de Chanel liquid liner in Bronze; Chanel Les 4 Ombres Multi-Effect Quadra Eyeshadow in Tissé Vendôme. The Chanel cream blusher in Cheeky looks pretty dark in the pan, but it sheers out easily and works on even with my ghostly winter pallor. (In the pan, it looks very similar to the Chanel cream blush in Destiny, but Destiny leans warmer/peachier; Cheeky leans a little rosier.) I keep this Bobbi Brown lippy in Blackberry in my stash for just these occasions when I want a deep, blackened cherry stain that leans more brown than purple. I thought that the blackened-brown earthiness of this vampy lip would harmonize with the look while still making a strong statement. As an alternative to a stained or satin/matte lip, I thought a gloss in that kind of blackened-brown cherry might be nice to add some shine to the look, so I pulled out Chanel RA Extrait de Gloss in Controversy. This shade has probably been discontinued since the Chanel RA glosses were reformulated, but I would imagine that there are lots of similar shades lurking around, and probably for less money! I find a really dark gloss handy to have around for the same reason that clear glosses flecked with, say, gold or platinum glitter or pearl are handy—they can really change the look of lipstick. A very dark, nearly black sheer gloss intensifies almost any lip color and can work particular magic on reds, at least in my experience. I could imagine wearing the gloss alone with this look, or wearing it over the black-cherry lipstick. Like the liner, the gloss comes in an opaque container, so it’s not much help to show you outside of the package! 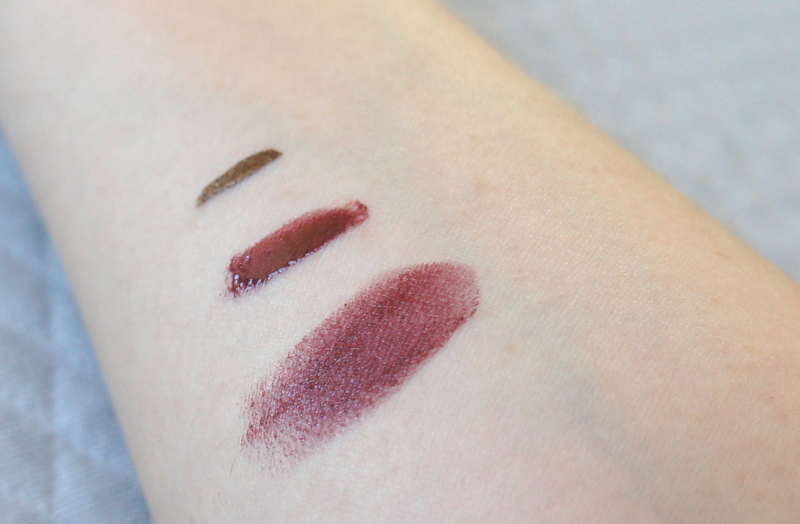 In that spirit, here are some deeply lousy swatches of the bronze liner, the black-cherry gloss, and the black-cherry lipstick, just so you can get a feel for the general idea behind them. Hopefully someday I’ll figure out how to photograph my own arm in focus. Sad swatch attempt! 😦 From the top, Ligne Graphique de Chanel liquid liner in Bronze 117; Chanel Rouge Allure Extrait de Gloss in Controversy 72; Bobbi Brown Lip Color in Blackberry. 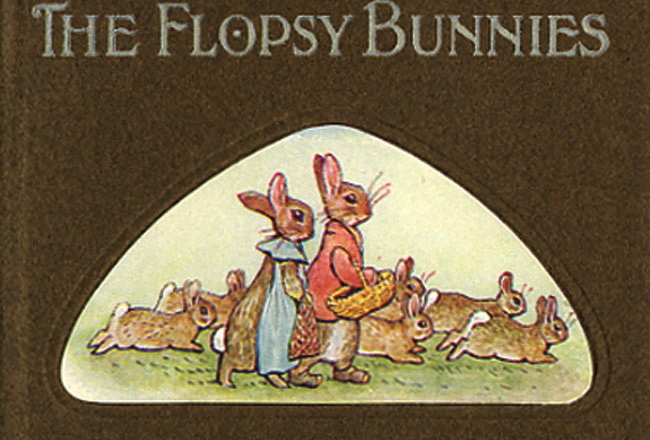 And that’s the final look inspired by the first-edition cover of The Tale of the Flopsy Bunnies. Thanks for the suggestion, roxina! I’ll try to post my sad version of FOTD pics if /when I try these looks out for reals. In the meantime, I wish you all a lovely day!